It is with much regret that I have to announce that Edward Bostock CBE of Twickenham, Middlesex, England passed away peacefully on 28th February 2006 after a series of small strokes. Our condolences go to his family. Edward was the original genealogist who built up a huge rolodex of Bostock and Bostwick family members. With the help of his son Roland, this information is being added to this site. Edward was a former Mayor of Twickenham and after his funeral on Monday 13th March, a large civic reception was hosted by the Richmond Borough Council. It was very well attended attesting to the high esteem in which Edward was held. You can view Edwards genealogical record, photos and official obituary on this web site here. 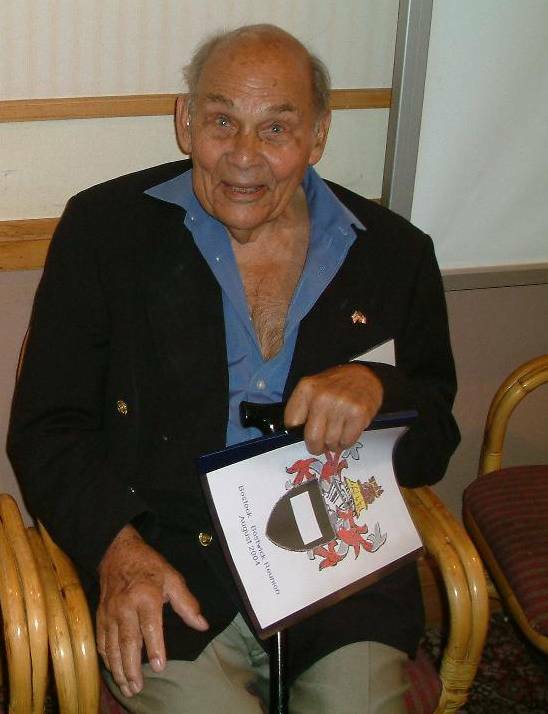 Edward is pictured below at the Bostock Reunion the day before his 96th Birthday in August 2004.